Farm is the mega-conglomerate food supplier for City, populated with rabidly bureaucratic superiors, and sexually deviant tour guides dressed in chicken and duck suits. City is sprawling, technocratic, and rests hundreds of feet above the coastline on the creaking shoulders of a giant wooden pier. When the narrator's single mother, whom he left behind in City, falls out of contact, he fears the worst: his mother is homeless and subsequently to be deported under City to the Pier. On his desperate search to find his mother, he encounters ecoterrorists wearing plush animal suits, City's all-powerful Mayor who is infatuated with magic refrigerators and outlaw campaigns, and an over-sexed priest who may or may not have ESP, but who is most certainly his deadbeat dad. 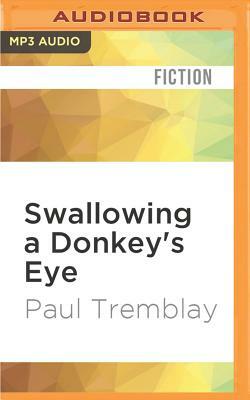 Whether rebelling against regimented and ridiculous Farm life, exploring the consumer-obsessed world of City, experiencing the suffering of the homeless in Pier, or confronting the secrets of his own childhood, Swallowing a Donkey's Eye's narrator is a hilarious, neurotic, and rage-filled Quixote searching for his mother, his own dignity, and the meaning of humanity.